InfoQ Homepage Articles What Are Self-Organising Teams? Surprisingly, there is relatively little material on what self-organising teams are about and how to support them effectively. Organisational development consultant Sigi Kaltenecker and agile coach Peter Hundermark are writing a short book “Leading Self-Organising Teams” to be published by InfoQ later in 2014. This is the first in a series of articles that will connect readers with the topic. Starting with “what are self-organising teams?”, we will continue in the coming weeks with “why do we need self-organising teams?” and “what is Leading Self-Organising Teams all about?”. “Knowledge workers have to manage themselves. They have to have autonomy”, leadership guru Peter Drucker states in his Management Challenges for the 21st Century. This resonates with the Agile idea that “self-organising teams choose how best to accomplish their work, rather than being directed by others outside the team.” (Scrum Guide). But what are self-organising teams? What is self-organisation about? What qualifies a group of individuals to be a team? fourth, stability over some reasonable period of time. executing the work, i.e. applying physical or mental energy to accomplish tasks. self-governing teams have responsibility for all four core functions as shown by corporate boards of directors, worker cooperatives or start-ups. resilience due to the system’s ability to repair and adjust. Referring to the original “principle of the self-organising dynamic system” as formulated by the cybernetician Ross Ashby in 1947, Heylighen helps us to understand that self-organisation is kind of the natural process of how global order arises out of the local interactions between the components of an initially disordered system. Thus, self-organisation is the rule, not the exception of systemic behaviour. Even in the agile world it is neither “a breath of fresh air” (Ken Schwaber) nor “a secret sauce” (Jeff Sutherland). Despite all the fashionable metaphors we use, self-organisation is a law that is applicable to many different systems. There is a broad variety of examples from neuroscience, physics, chemistry and biology: the brain with all its connected neurone that construct mental models without relying to single control; plants such as aspen groves the largest known living organisms on earth. each tree contacted to all others by the same underground root system; flocks of birds, gangs of elk or herds of sheep, being able to move together in a synchronised manner as if they were a single animal especially in avoiding danger or changing course; or ants creating a system of finding food out of seemingly random movements. What conclusions can we draw from these insights? What do the laws of systemic behaviour mean for self-organising teams in a business environment? First of all, we should remind ourselves that becoming a self-organising team does not happen overnight. Nor is self-organisation something that happens one time and remains forever within the very same boundaries. As a matter of fact, a team is never done with the process of self-organisation. They have to continually reorganise themselves in an sense-and-respond manner to shifting demands and contexts. In other words, self-organisation is an ongoing process: whenever the set-up changes, the organisation and the team need to repeat the whole process. Self-organisation is not just about the whole team within its specific organisational context. Each team member has to self-organise as well to figure out what to do and how to do it. And every day, everyone on the team has to coordinate his or her self-organisation with the rest of the team. In order to synchronise, we run regular meetings such as the “Daily Standup”, “Operations Reviews” or “Retrospectives”. Another pillar of all self-organising teams is that they build on a tricky balance of similarity and difference. Paradoxically, in order to effectively exploit their differences, team members need to share enough similarities. As German systems thinker Diether Gebert shows in his data-driven survey on innovative teams, teams have to grant each other some trust in the first place. Without a certain amount of trust in advance they can neither explore their individual backgrounds nor inspect and adapt current work processes. Later on, an appropriate balance of recognition and reward as well as fair play are important factors for further self-empowerment. Disrespect kills self-organisation in a similar way to social loafing. A containing (C) boundary that surrounds the system to define its identity. Simply speaking, there is no clear “self” without a clear separation of “the other ones”. This kind of container builds on organisational pillars such as a clear-cut mission, a compelling direction and challenging goals, operating guidelines and clear decision-making policies. Significant differences (D) such as different knowledge, experience, education, age, gender or cultural background. High performing teams know how to acknowledge and incorporate the diversity of the team and how to build on the differences that make a difference. Transforming exchange (E) guiding the interactions both within the team and with its environment. According to Eoyang, this transfer of information, energy or material between interdependent people or units is critical to the ability to self-organise into system-wide patterns. infrastructure – in terms of appropriate physical space (a factor many co-located teams struggle with), technical infrastructure and money. reward – in terms of providing positive, economic as well as symbolic consequences for good team performance. Figure 2 has a collection of elements of different size, shape and colour in its centre, representing team members with different background, strengths and skill-set. As the linking arrows show, the members are connected with each other, building up a cross-functional team by intense exchange/communications. 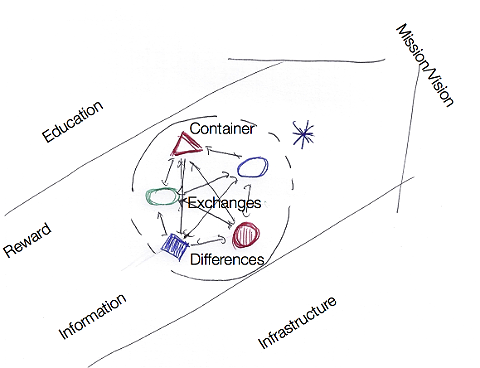 The whole team interaction is surrounded by a boundary, partly dotted to indicate that this container is an open rather than a closed system. Far from being a classical black box for its environment, the team is dependent on its environment. They need a supportive context in terms of the indicated sub-systems of infrastructure, information, education and reward. And they need an external agent, represented by a snowflake symbol, who is responsible for this support. This is the role of the line manager. Although eliminated from the picture to keep it as simple as possible, the interdependence of the team, its connectedness in terms of value stream and the necessary customer focus and organisational awareness are key to any self-organising process. We have observed that real teams have a compelling mission, clear boundaries, authority to self-manage and stability. We have observed that self-organisation in teams is built on a tricky balance of similarities and differences between team members; self-organisation requires clear boundaries and a supportive context; self-organisation is characterised by distributed control, continuous adaptation, emergent structure, feedback and resilience. Lastly we have observed that self-organisation takes time. Drucker, Peter: Management Challenges for the 21st Century. HarperBusiness (2001). 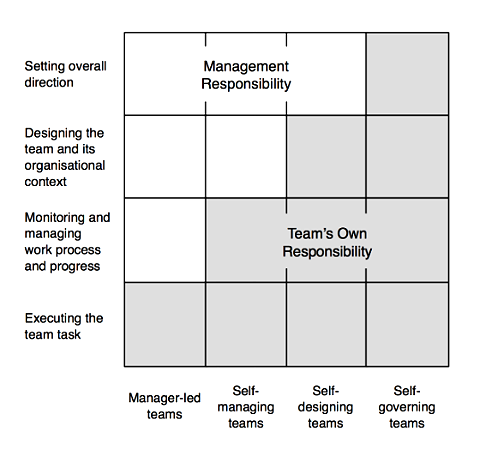 Hackman, J. Richard: Leading Teams. Harvard Business School Press (2002). Hackman, J. Richard: Collaborative Intelligence. Berrett-Koehler (2011). Heylighen, Francis: The Science of Self-Organization and Adaptivity (2001). Wheatley, Margaret J.: Leadership and the New Science. Berrett-Koehler (2006). Sigi Kaltenecker is the joint managing director of Loop Consultancy in Vienna, helping individuals, groups and organisations to successfully master their professional challenges. He is a Certified Scrum Master, Kanban Coaching Professional and co-editor of PAM. Sigi co-authored the book “Kanban in IT: Creating a culture of continuous improvement” which will be published in English in 2015. Reach him at @sigikaltenecker. Peter Hundermark is a Certified Scrum Coach and Trainer and a Kanban coach at Scrum Sense. He focuses on organisational development, change management and leadership development to help bring agility to the world of work. He is the author of Do Better Scrum. Reach him at @peterhundermark. it's really nice that will be a book on self organisation! it is an area that there is a lot of discussions but few concrete suggestions how to enable self-organisation and the need for self-organisation! Under that context, i would like to share with you a theory on self-organising agile team from Dr. Rashina Hoda! in the grounded theory, as an outcome of her recent research, the main findings are the self-organising roles, the self-organising practices and the critical factors influencing self-organising teams (management support & customer involvement). Through participant's observation for one year in a new scrum team, i performed a single-confirmatory case study on Dr. Hoda's theory with really good results that gave me more insights how to steer my teams to self-organise. One of my insights was that a possible combination of that theory with the High Performance team coaching system from Dr. Carr and Dr. Peters that is based on R.Hackman study on teams (and his rule on team effectiveness 60%team design, 30%team launch, 10% coaching) and the ICF core competencies, someone could expect that self-organisation could happen! i am in the phase where actually i am experimenting with the High Performance Team Coaching system while taking into account the outcome of Dr. Hoda theory on self-organizing agile teams! i could share with you my results if you think will be useful in your study! I have published my views on Self Organizing Teams at my blog.